Turn that frown upside down! - Welcome to The City of Desire. My Second Layer Cake. a photo by Leenechan on Flickr. Not a happy-looking cake here, but it tastes good! We made this one using Cook's Illustrated's recipe for Fluffy Yellow Cake, and it turned out tender and lovely. 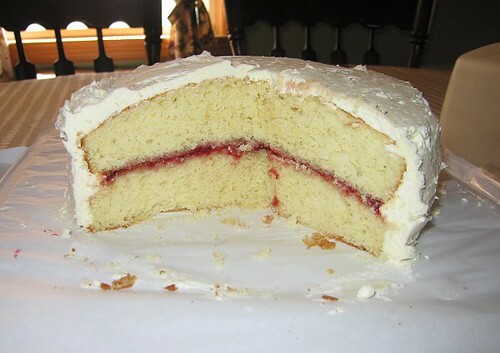 The filling is raspberry jam and the frosting is lemon buttercream. My only gripe about the cake, other than the fact that it ain't pretty (I lacked the tools to make it beautiful) is that the frosting didn't have a strong enough lemon flavor. Next time I'll use more zest, or juice. Or find lemon liqueur. I'm not using lemon extract, though. That stuff tastes like furniture polish.